The sun has risen and set 6,203 times since the last time the Baltimore Orioles played in an American League Championship Series game. That’s 17 years since Armando Benitez gave up that heart breaking home run (with Benitez, you usually need to be more specific when talking about heartbreaks) and Robbie Alomar struck out without swinging his bat. So much water has gone under the Bay Bridge since that chilly October night, yet, with the Orioles dominant again, it seems like yesterday as the memories come flooding back. A few weeks after that game, I asked Andrea to marry me. A few months after that, I headed to New York to take on my dream job at the Mets. Three years later, I’d get my National League Champions ring from the Mets (to this day, I know in my heart it was that choke artist Benitez that kept me from a World Series Champions ring). Eight years later I’d look into the eyes of my new born son. Ten years later, my second son was born. Fifteen years later, I’d be standing on a Little League field coaching my boys’ Tee Ball team. Seventeen years later, I sit in front of a computer with a million different memories of those days with the Birds and I go from happy to sad as the nostalgia of all of it confounds my emotions. 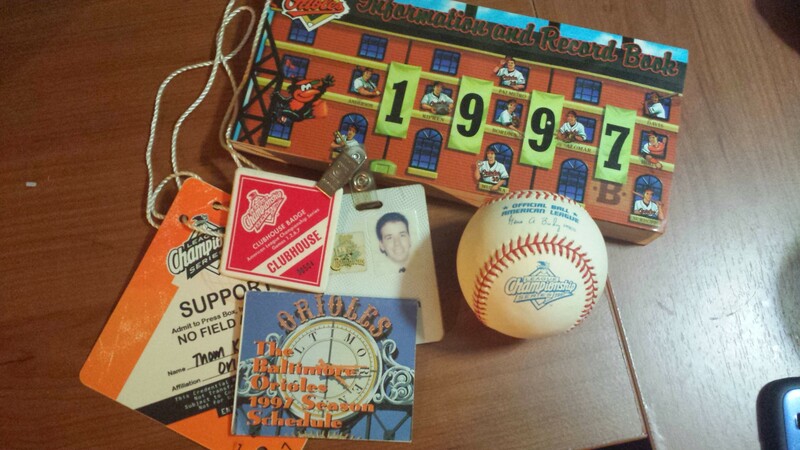 It’s been a long 17 years, especially in terms of being an Orioles fan. It’s funny, when I think about those days and those Orioles, it’s really not the team or the players that stick in my mind. In fact, I need to look up details of those games, as they don’t readily come to mind. What I do remember most are the people that I worked around, for and with. Memories of victories aren’t of the team celebrating on the field, they are of celebrating with my co-workers when our jobs were done. Winning the 1996 ALDS against the Indians was awesome, but it was celebrating with my managers as they got off the bus from the airport with what seemed like the entire city of Baltimore surrounding us. I don’t remember the last out of the 1997 ALDS win against the Seattle Mariners, but I remember hugging, laughing and cheering with the other interns in the hallways of the warehouse afterwards. When there wasn’t much to celebrate, during the long middle months of the season, there was still whiffle ball games in the warehouse halls after extra inning games, philosophical discussions about the powder eggs they served in the press lounge on early Sunday mornings and making plans for after game shenanigans in Fells Point as we waited for them to call rain outs. A baseball job is demanding and, in many ways, our coworkers were like family. Even in losses, it’s the bittersweet moments with those people that I remember most. Even in the hours after Alomar struck out, I remember sitting in the warehouse quietly laughing between tears with these wonderful, hard working friends. Even after losing to that other damned team from New York in 1996, we still celebrated well into the early morning hours the next day, bar hopping and laughing like we had just won the World Series…We weren’t happy that we lost, and if my co-workers were like me, we cried ourselves to sleep when we did finally find a bed (that damned kid, his glove and Derek-freaking-Jeter), but we had worked so hard for 10 months and the only thing we could do was enjoy that time together when there was nothing left to worry about. It was hard work and even longer hours (I once put in a 36 straight hour stretch without leaving the warehouse) and I am not going to pretend that all of us got along. There were tense times and moments when you just wanted to be left alone. But I think that was what was special about those times and those people. They were bonds that were forged in fire and moments that so few people could really understand. The lows of that job would go so low and the highs…well, there was just nothing like that. In between those moments were a group of people who loved baseball, loved the Orioles and, at some level, loved those moments with each other. A very vivid memory for me was in the early morning hours after the last ALCS game in 1997 when a few of us were left hanging out in the warehouse. The stands were empty, the AL Champions were on their way back to Cleveland and we had nothing left to do except wait for the stats to transmit to MLB and do our best at finishing off the beer. The lights were turned low on the field (one of my favorite views of a baseball diamond) and most of the staff had left. Hoping to rally the city and the team before, we had thousands of “WE BELIEVE” signs printed and given out at the stadium. There was one of them on the door to reception. After we finished our beers and realized there was nothing left to do but go home, we gathered our stuff and walked out. On my way out, I ripped the “BE” from the sign so that it just read, “WE LIEVE.” We laughed about it, and went home. However, the altered sign ended up having a much deeper meaning. People started leaving the Orioles for other jobs. I left in February of 1998, and at the time, it felt like I was one of the last ones out the door. Of course, it wasn’t true…it just felt that way. A few people still work for the Orioles. However, that just seemed like the end of an era, whether or not it was a good ending, and we went our separate ways. It was a sad way to leave and even in the great moments with the New York Mets, parts of me still wished to be celebrating with my friends in Baltimore. When I look back at my 40 plus years, those days were among my happiest. Never in a million years would I trade my current life for those days, but those times and the people in them will forever hold a very special place in my heart. After all these years, especially in the light of the Orioles recent successes, I still feel close to them…still feel that special bond, reaching across 17 years. It’s probably been 15 years since I’ve spoken to many of them, it still feel like I am celebrating with them. And while the New York Mets will always have a lock on my baseball heart, the Baltimore Orioles will always be so very special to me. I’m not going to pretend and say I am a huge fan of the Orioles today, but I always quietly says “O’S!” to myself whenever I hear the National Anthem. It fills my heart with joy to see them doing so well and them winning the ALCS and World Series would make me almost as happy as if the Mets won. The team and the people I worked with there will always be dear to me. I hope that the current members of their back office staff are enjoying these times as much as we did.